A middle aged gentleman presents with a basin filled with bright red blood. He’s choking, gagging and every ten seconds coughing up another huge mouthful. His daughter tells you that he has a base of tongue tumor that, 20 minutes ago, started bleeding. A lot. Asphyxiation and exsanguination are both immediate concerns. He clearly needs to be intubated now. But how? Awake technique is very unlikely to be successful; the patient is in extremis, blood pouring out of his mouth. He will need RSI. But you have at least two reasons to be concerned about RSI: 1. The huge amount of blood filling the oropharynx will obsure your view of the glottis. 2. The base of tongue tumor. Lord knows what you’ll see when you get in there. The answer: Four Provider ED Double Setup. Provider #1: Performs video laryngoscopy. Provider #2: To the right of provider #1, performing suction. Provider #3: To the left of provider #1, peforming suction. Provider #4: At the patient’s side, prepared to perform cricothyrotomy. For patients with massively bleeding oral lesions, bilateral suction, simultaneous with airway visualization, is necessary. Until recently, this was almost impossible, because only the operator can see the glottis during conventional laryngoscopy. Video laryngoscopy, however, has changed the rules. In addition to getting your eyes much closer to your target, with video laryngoscopy more than one person can participate in laryngoscopy at the same time. The magnitude of this advantage wasn’t apparent to me until a middle aged gentleman with basin filled with bright red blood presented himself in the process of both asyphyxiating and exsanguinating. I’ll bet there are other useful techniques made possible by projecting the airway onto the big screen for everyone to see. 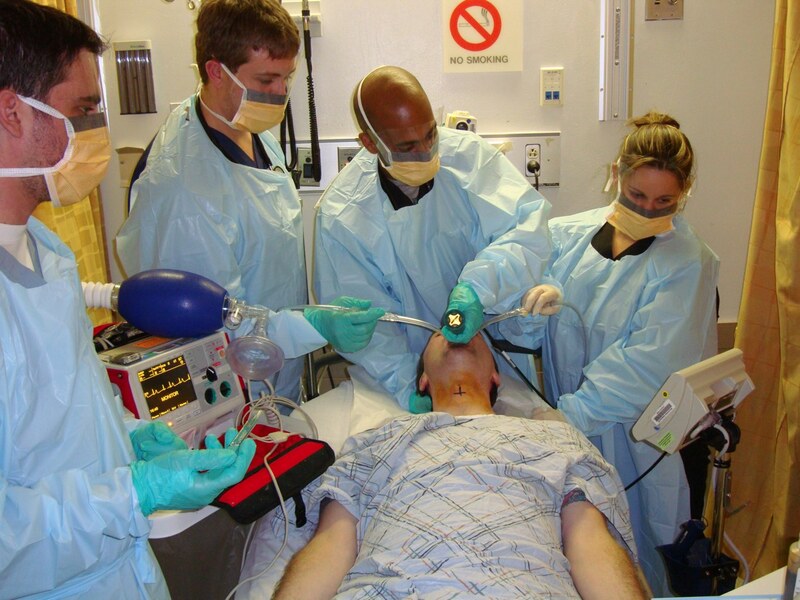 Laryngoscopy is now a team sport. Thanks to Vishal Demla, Elizabeth Dei Rossi, Taylor Moran-Gates, Daniel Mindlin, and especially Eduardo Lacalle.